This book will open your eyes to the realities of practice as an architect. There is sometimes a disconnection between what is taught during architectural education and the actual experience of entering the work place. With relatively little space in the packed architectural school curriculum, professional practice content tends to focus on the facts â€“ legislation and contracts - rather than practical skills and lessons from experience. Yet understanding the value of good communication and business skills or how to promote yourself and your work may just make the difference to your survival in this highly competitive marketplace. This concise and punchy guide aims to challenge your assumptions about what â€˜successâ€™ in architecture is and how to achieve it. 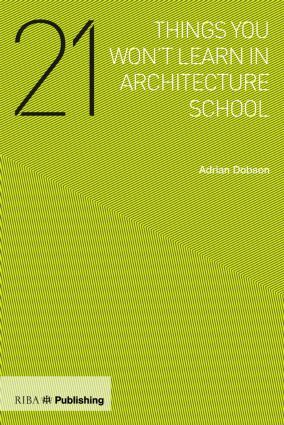 In Part 1 Adrian Dobson, the RIBAâ€™s Director of Practice, gives you an insight into the 21 â€˜principlesâ€™ he thinks all architects should grasp when trying establish their professional careers. He draws lessons from psychology, sociology, marketing, economics, persuasion and resource management all of which are highly relevant to success in architecture. In Part 2 a diverse selection of highly individual, creative and respected architects, with very different business models, specialisms and approaches, give you the inside story on their journey to prominence â€“ offering you invaluable insights into the makeup of a successful architect and how to approach the years of practice ahead of you. The interviewees include Caroline Buckingham, John Assael, Simon Allford and David Partridge. Adrian Dobson is Director of Practice at the Royal Institute of British Architects. He is a Chartered Architect with practice experience primarily in the education and community sectors. He has also taught in higher education and carried out research in building information modelling. As RIBA Director of Practice, Adrian has been at the forefront of the launch of the new RIBA Plan of Work 2013, the key design and construction process map used throughout the construction industry. He has also been closely involved in supporting authors in the development of key RIBA practice publications including the RIBA Job Book, the RIBA Handbook of Practice Management, the RIBA Agreements and A Client’s guide to Engaging an Architect.